Summary: In Moose Jaw to be the junior bridesmaid for her cousin, Andrea Talbot learns about the tunnels under the city in an intimate way as she travels back in time to the 1920s when they were in use. Trained to be a tunnel runner by Vance and mistaken for a boy with her short haircut, Andrea becomes Andy and encounters the seedy under life Al Capone and his cronies have created to subvert the prohibition. During one memorable night, Andrea finds out the true meaning of loyalty and friendship, risking her safety to rescue people she’s only just met, but feels like she’s known forever. When Andrea wakes up from her time travelling adventure, her experiences have matured her, and she finds out just how real they were. Review: I loved the story of Andrea’s adventure in the Moose Jaw tunnels. So inventive and exciting, while being informative about a piece of Moose Jaw’s vivid history. My favourite character was Beanie. She may have been odd and a bit hot-tempered, but she acted impulsively out of love and intense loyalty for her family. Imagine a ten year-old thinking she can take on Al Capone! She’s so endearing and colourful, and I was glad Andrea was around to rein her in and protect her and her brother when they needed it most. I also loved that Beanie was so accepting of Andrea’s true story, and knew she was really a girl immediately. For a story that took place during the course of one night, it has a lot of action and great character development. Without giving too much away, I enjoyed how Bishop wrapped up her story, tying the past to the present. It was an easier read with heart, and highly engaging. There are five books in the series, which means I have a lot more reading to do after my Marathon of Books. I’d recommend them enthusiastically for pre to early teen readers. 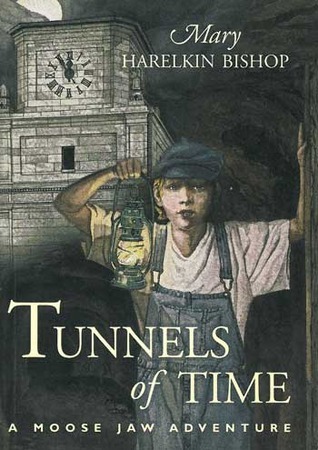 Tunnels of Time by Mary Harelkin Bishop, is published by Coteau Books, (2000).